Yet another concept car in the long line of teases Cadillac has created over the last decade or so. The Cadillac Cien was the mid-engined, V12 powered, scissor-doored supercar America deserved. If you remember anything from 8th grade Spanish class, Cien means “one hundred”. Appropriate for the car built to celebrate Cadillac’s 100th birthday. Unfortunately, this car was nothing more than an experiment with direct injection and a cylinder shut-off fuel management system. 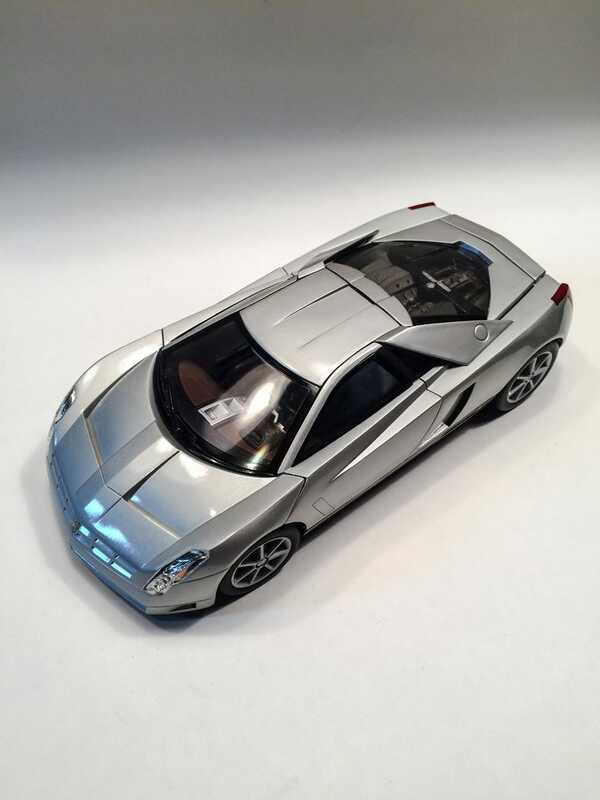 This is Hot Wheel’s take on the concept car in 1:18th scale. After months of searching, I was finally able to find one on eBay for less than $30. It didn’t have its original box, but who needs boxes anyway?! This model shares many similarities to my TVR Speed 12 and Viper GTS-R. Heavy build mixed with some plastic body panels and jusssst enough details to get you excited. Of course the doors open, the whole model would be pointless if they didn’t. I know scissor doors are kind of played out, and at the time even Lamborghini was getting away from them, but I think they were a bold statement from Cadillac. Hot Wheels couldn’t have made these doors any better. They do exactly what they are supposed to do: stay open for display. As a fan of funky ways to open a door, I’m always disappointed by a droopy Gullwing or a scissor door that keeps trying to chop my fingers off. The back hatch lifts up to reveal the 7.5L Northstar V12, but unfortunately there’s not a lot going on here. None of it is Hot Wheels’ fault, this concept debuted at the dawn of the plastic engine cover epidemic. There are some suspension bits and a nicely detailed strut bar. The front and back clearly have plenty of Arts and Science design influence. Plenty of edges and somehow still looks curvey. Did you notice no side mirrors? That’s because the Cien had rear facing cameras. A great feature when buying a model with no box! The interior is all-in-all not bad. It looks like leather but still clearly looks like plastic. The center console is well detailed and neat touches like the door sills convince you to leave the doors open. My only real gripe with this model are the wheels; they just seem... off? The profile of the sidewalls seems to be too high or the rims seem too small. Or maybe it’s all with the rotors, which don’t look like they’d provide too much stopping power lining up outside of the caliper like that. I'm definitely excited to cross this model off my want list. It's definitely worth adding to your collection of concept cars. Deals can be had out there if you are patient enough. I had made many unsuccessful best offers through eBay but in the end, I was the sole bidder on this car for $26. Ford had the cajones to put its 100th birthday gift to itself, the GT, into production and it became an instant legend. It’s too bad GM didn’t roll the dice on the Cien, even if it never was intended to be a legit supercar.